A simple framework for thinking about what drives your mood and how you can respond more productively. One useful framework for better understanding how moods work is called the Mood Balance. 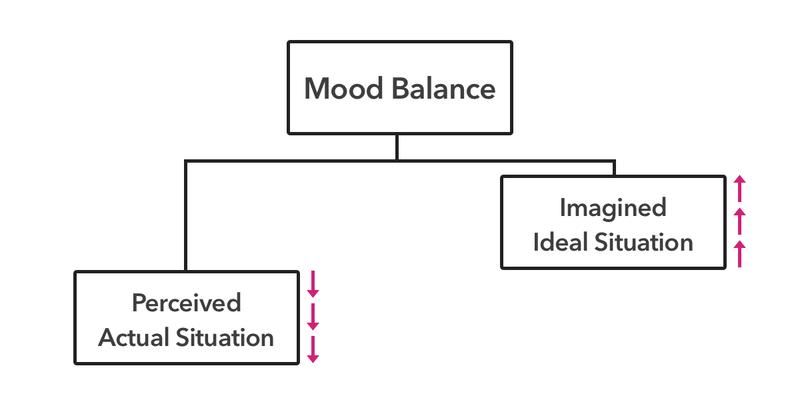 By a “Mood Balance” we mean a relationship between an actual situation in your life as you perceive it and an imagined ideal situation. The diagram above indicates that your mood is the result of a comparison between your perceived actual situation and your imagined ideal situation. The following diagram illustrates the internal imbalance that is created when your perceived actual situation ranks low relative to your imagined ideal situation (arrows in the figure below). In this case, your self-esteem falls and your mood becomes more depressed. If the two situations of your mood balance rank close to one another, then you feel better about yourself and your life. In a good mood, your perceived actual situation is close to, or simply moving in the direction of, your imagined ideal situation. 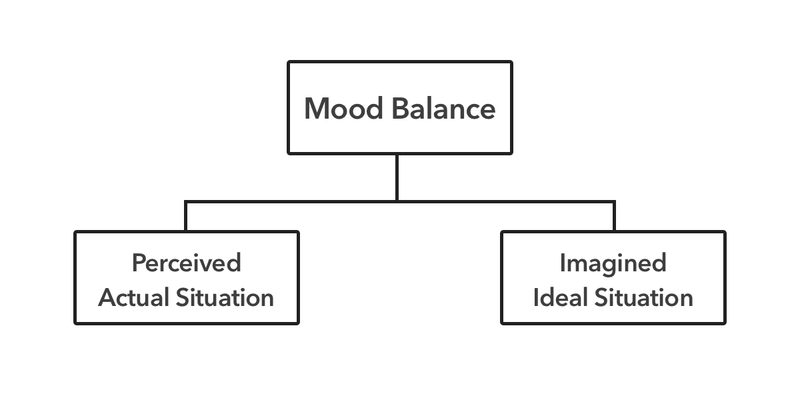 The implicit disparity between the two situations of your mood balance must be made explicit by putting the situations into words, and carefully examining them and consciously working to revise them. It is often the case that our perception of our actual situation is incorrect, or improperly interpreted. It is also common for us to have highly ambitious but unclear ideals. In both cases, we are unfairly interpreting the two situations in a way that creates a Mood Balance that is unnecessarily difficult to live with. Through Open Dialogue and other forms of self-examination you can work to re-evaluate your perception of your actual situation so that it is more realistic and accurate. You can also re-examine the values that influence your imagined ideal situation so that you can establish objectives that are more suitable for you.